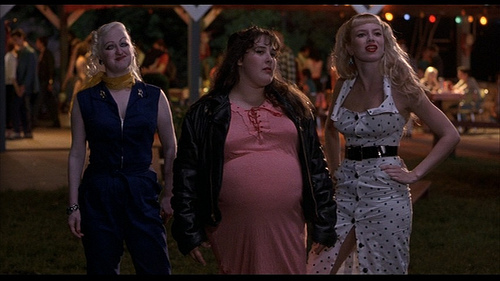 As all cheesy 80’s movies go, each character usually dresses totally fab or terribly bad. Traci Lords plays Wanda Woodward in the 1990 film Cry Baby (also starring Johnny Depp). With her brilliant blonde hair and her skin-tight pencil dresses, what’s not to love about the fabulous Queen of the Drapes?! Here’s a quick look at some of my favorite scenes which really make me want to cut my bangs, wing my eyeliner, and top it all of with a fire engine red pout! Wanda is the epitome of cool. Her hair is always done and her lips are always bright red but she never looks too done up. Looking great is all about being you and not trying too hard. Wanda wakes up, throws on a pencil skirt and a leather jacket and she's ready to rock and roll as the cities (by-far) sexiest drape. Without a care in the world Wanda takes pin-up styles and makes them wearable. What do you think of this blonde bombshell's style? Love it or loathe it, let us know!